Some spring mornings are perfect. Most of the time, we leave home with the understanding that we are going to come home empty-handed. There was just something about the morning of May 3, 2014 that was magical. After an endless work week my wife and I left Morgantown, WV and made the journey to Beckley, WV to hunt the end of the first week of the West Virginia season in Wyoming County, WV. Our Osceola guide Larry Hamilton, long-time friend Jim Hayes, Morris Walls (my dad) and I headed into the woods for an unforgettable morning. We arrived at a high ridge well before daylight and hopped out of the pick-up truck to listen. It was 42 degrees with little to no wind. The skies were cloudless, and whippoorwills were singing all around us. Then, the turkeys started gobbling in every direction. There were so many birds gobbling that we were not sure which way we should go. Many turkeys were gobbling, but they were all at a distance. The closest bird was probably around a mile away so we decided to try to get to him. My dad had hunted the area the past few days and he said, “I know where those turkeys are.” It is always good to hear that. We parked beside the gas well road and headed out a logging road that followed the top of one of the points that ran off of the main ridge line. We walked a few hundred yards and came to a fork in the road. The bird sounded like he was on the left of the fork, so we headed that direction for the first set-up. After calling for 10-15 minutes, it sounded like the bird was going up the other side of the hollow, out the right-hand fork of the road. We picked up our calls and changed positions. We were scattered around the woods like Mayapple. Larry was the shooter and he sat to the left. Myself, my dad and Jim were up the hill and to the right. The gobbler was still several hundred yards away. I was hoping that he would follow the road around the top of the ridge but he didn’t. I called multiple times and the turkey answered almost every call. The problem was that he was not getting any closer. He walked back and forth, back and forth. I did a series of gobbles and jake yelps on my tube call. The turkey gobbled back twice with enthusiasm. He shut-up, I shut-up. Several minutes passed and there was no gobbler or gobbling to speak of. About the time I was going to give up, he gobbled about 80 yards over the mountain after a series of yelps on my mouth call. Instead of following the ridge, he crossed the hollow in front of us. A few more calls and the turkey was at 30 yards from Larry. This mountain bird had the most beautiful “yodeling” gobble that I have heard in a long time. I started to hear spitting and drumming and then the shot, boom! Larry harvested a 20 pound, three-year-old West Virginia turkey with a nine and a half inch beard. We then took photos and reflected on the hunt. It was only 9:00 a.m.
We spent the following two hours covering country, lots of country. The gas well roads and power lines make it easy to navigate the area in a vehicle or an ATV. Around 10:30 the wind started to pick-up so we chose to get on a road that was off of the main top and listen deep into the hollows below. We pulled up to a gas well location and parked. We walked a few hundred yards to the edge of the location and called. A gobbler cut me off. While we are standing there looking for a place to set-up, I whispered, “listen.” He was walking up the dry hollow, and I could hear it loud and clear. I had my dad and Jim stand in place and look over the embankment. I walked to the center of the well location and called a few more times when I saw Jim tighten on his gun. He squeezed-off the shot and the turkey tumbled down the steep face of the mountain. We were on going wild! Two birds in the same morning! Sometimes, things seem to work-out for the good. This was one of those days. Normally we would have spooked the bird and the hunt would have been over. He was just far enough down the mountain that we could get in position for the shot. You have to love those suicidal, 11:00 a.m. two-year-old turkeys. This bird had three-quarter inch spurs, a nine inch beard and weighed 16 pounds. Jim has killed a lot of birds, but this one was the first that he has shot while standing. 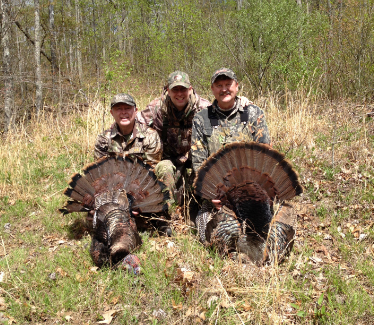 This turkey hunting morning was one of the finest that I have experienced in a long time. I can’t wait until next Saturday.